There is no better way to introduce your child to the magic of orchestral music than through a collaboration with their favourite musicians. When The Wiggles and the Melbourne Symphony Orchestra get together it’s going to be a wiggly party that will have you pointing your fingers and doing the twist! Even if you have been to a Wiggles concerts before (and even if you feel like you couldn’t take one more), The Wiggles Meet the Melbourne Symphony Orchestra is refreshingly fun. Bright coloured skivvies mix with black and white tails, while funky kids dance songs get a classical twist. Kids and adults alike are invited to dance and sing along with the MSO, The Wiggles and their friends Dorothy the Dinosaur, Henry the Octopus, Wags the Dog, and Captain Feathersword. This excellent event will be at the Melbourne Town Hall on Friday, 5 June at 12:30pm and again at 2pm. Tickets are now on sale but best to get in quick because they are selling like hot… poppin’ popcorn (you thought I was going to say potato, didn’t you?). Tickets are priced at $50 full or $40 concession. You can book through the MSO website. All kids over 12 months old require a ticket. The event will also launch a new Wiggles CD called The Wiggles Meet the Orchestra, which will go on sale Australia-wide from 6 June. 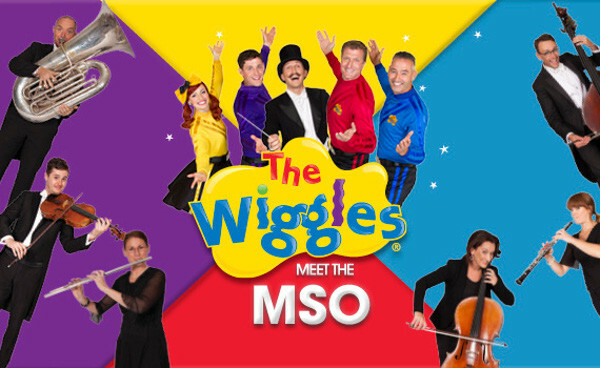 A DVD of The Wiggles and the MSO will be released later this year too and we will keep you updated!